RAVEN are that rare thing in music, true originals - cut these guys with a razor and they will bleed true heavy metal - a more intense live band does not exist on this planet! Hailing from Newcastle Upon Tyne in North East England back in 1974 (yes - 41 years ago!) the brothers Gallagher cut their teeth playing the pubs & clubs until solidifying their line up in 1980 with drummer Rob Hunter. The trio went on to release three of the most influential metal albums of the NWOBHM (New Wave Of British Heavy Metal) on the Neat records label which in turn inspired every band of that era and beyond. Basically, without RAVEN you just would not have thrash/speed metal.... after all, the band did give METALLICA & ANTHRAX their first tours! Following a tumultuous move to the USA, deals with Atlantic Records, indentured servitude and commercialism, Rob left the band in 1987 to be replaced by drummer extraordinaire Joe Hasselvander, who had made his name in cult doom band PENTAGRAM, SAVOY BROWN and his own solo projects, adding a new dimension to the band. Rebuilding from the Atlantic experiences, the band capitalized on their fierce live performances steadily releasing albums and touring the world. In 2001, guitarist Mark Gallagher was involved in a near fatal accident - but fought his way back from the brink and the band proved they were stronger than ever! This renewed spirit and attitude was reflected in the title of their 2010 album Walk Through Fire and in the career overview DVD Rock Until You Drop. In a cynical musical landscape these days, where bands are not "gangs" but corporations...where albums and live shows are click tracked & pro-tooled to death... where a band's line up can change every few months with "hired guns" who float in and out - RAVEN are almost alone among their peers in that they boast a lineup featuring the same three guys - a line up that has been stable for the better part of three decades! RAVEN are a band that is real, not fake - and proud of it! 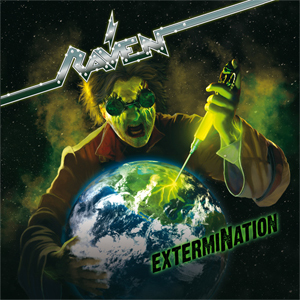 RAVEN had an exciting 2014 - opening for METALLICA (the band who RAVEN took on their first tour back in 1983) in Sao Paulo in front of 70,000 fans, and completing a 43 date headlining USA tour - not to mention completing their finest album to date - ExtermiNation slated for an April 2015 release worldwide on SPV/Steamhammer! This album combines the melody/chaos/musicianship/lunacy that defines the band with songs that are simply the best they have done in decades. Rivaling the "holy trinity" of those early albums, and again working with the engineering metal mastermind who is Kevin 131 (WALK THROUGH FIRE) - the band have taken their game to the next level...this may well be their 41st anniversary but these guys are only just getting started! In commemoration of Bon Scott`s death 35 years ago, RAVEN release a snippet of their new song "Thunder Down Under". Check out the song below. ExtermiNation will be released in Scandinavia on April 22nd, in Germany on April 24th, in Europe on April 27th and in the USA on April 28th as a digipak version (incl. 1 bonus track), 2LP gatefold green vinyl version and download through SPV/Steamhammer. "It`s Not What You Got"
"Battle March/Tank Treads (The Blood Runs Red)"